Analog Artist Digital World: A Digital Artist in a Digital World? 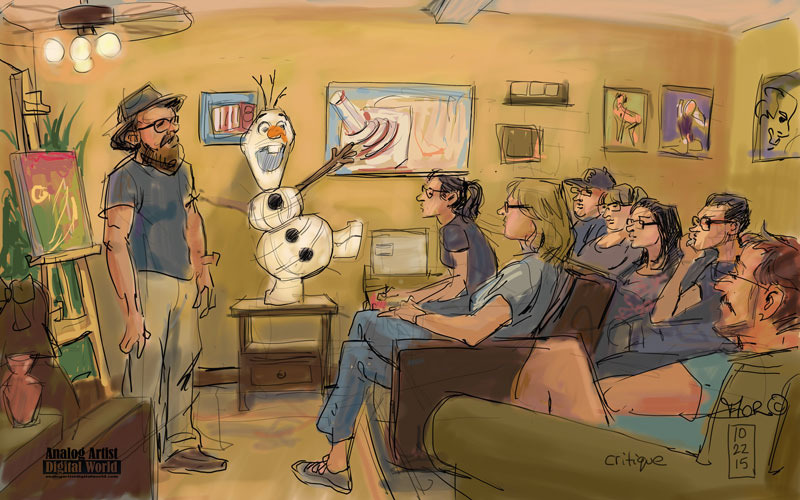 On October 22, I went to Parker Sketch's monthly Artist Critique at the Barefoot Spa, 801 Virginia Dr, Orlando, Florida. This group of artists and art appreciators gathering to help each other grow as artists. You don't have to be an artist, or show art to participate in the discussion, and meet the artists! It is a supportive and constructive discussion group about art. We look at the work of about 12 artists in the evening and talk about it. The opportunity to show art is first-come-first served. If you are interested in art and want to meet other people who also enjoy art, this is the event for you. The art can range from the purely abstract to representational. I always learn something new each time I go. The reason I wanted to show art this night was to see what other artists felt about m using a tablet to start creating my sketches done on location. I'm excited a bow the possibilities in the digital medium but Terry says she cringes every time she sees a digital sketch on this site. I decided to show one of my sketchbooks and the sketch [ did on the tablet of the critique. sketching digitally is still difficult because [ waste so much time looking for tools and menus. Recently I've bee streamlining my work flow by learning how to use my tablets keys to select the most common tools. I asked everyone if it made sense to try and recreate my watercolor sketches in the digital medium. Most artists felt that the traditions sketch had more spontaneity and they could clearly see that a digital sketch has z different look. Parker suggested that I take an entire different approach to the digital work, accepting the difference. He even suggest using the tablets camera as the starting point and built the sketch over that. When I confided that the tablet seems too small, Bethany Taylor Meyers suggested I do a traditional sketch on paper, then shoot that with the camera and start painting digitally. I love that idea since I can us a bigger sketch pad and maintain the traditional feel of pencil on paper. Other artists critiques also inspired me to push in new directions. One artist is trying to pull away from dark line work. Although I love line, the digital medium seems to favor blocking in colors as if building up an oil painting. I'm convinced that the digital work will inspire change in the traditional sketches and vise a versa. Someone suggested that I start using gouache on my traditional sketches and ironically the is something I've been considering for some time. There was so much amazing art shown that night, and having feedback from fellow artists is indispensable. Parker showed a large "Falling Man" painting. I've seen other paintings from the series and they are usually monochromatic. This falling man was fractured into vertical strips and had intense bright colors like cadmium yellow and bright pink. 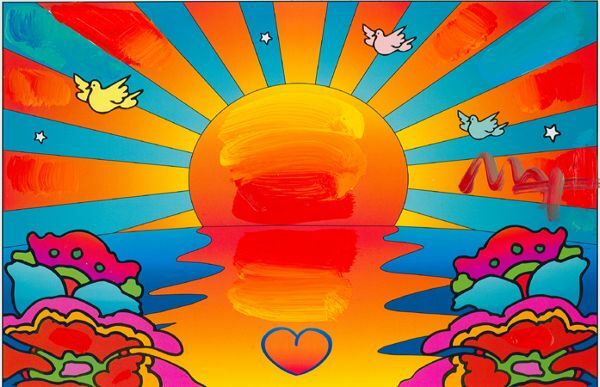 The image is a haunting reminder of 9-11 for me and the bright Peter Max inspired colors seemed a stark contrast. Parker did the painting live at Artlando with constant interruptions as people asked questions. He said the colors were happy accidents because they just happened to be the colors he packed that day. If you click the subscribe button over in the right column, I will keep you informed next time there is an artist Critique. The subscription is for a weekly AADW e-mail newsletter.